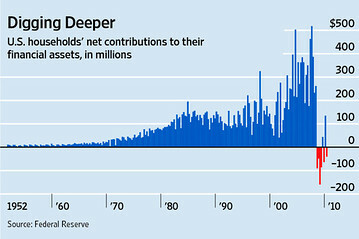 There were no net withdrawals during the 2001 recession. Nor the 1991 recession or the 1981 recession. Nor during the oil shock recessions of the 70s. Not during any recessions until now. It’s just another way in which the the 2008-09 recession has been the most damaging to household finances since World War II.